There’s a large wooden fruit bowl to the left of my kitchen sink. It’s usually filled with everything but fruit including sweet potatoes, garlic bulbs, a few wooden toy trains and lately: zucchini. I make zucchini bread at least once a year, in summer obviously when the entire universe seems to be inundated with the sheer thought of zucchini. But I don’t mind, really. I love a good zucchini bread spiked heavily with cinnamon, that begs to be gobbled up with strong coffee and 5 minutes of peace and quiet. I can’t imagine anything more heavenly. And this delectable chocolate chip version, baked ‘bundt cake style’ certainly hits the spot. Already on the blog, I have a somewhat non-traditional zucchini bread made with whole grain flour and honey. But because I can’t stop tinkering with recipes, I decided to create and more ‘normal’ version (according to my kids), made simply with plain flour, sugar and chocolate chips. It’s not excessively sweet, has great texture and crunch, and is one of those things you’ll make over and over again even in the summer heat! Serve this at your next gathering, share with co-workers, or just leave a few slices on your kitchen counter for general grazing. It’s a good one. Enjoy! Tips: when making the recipe, don’t forget to add the grated zucchini to the wet ingredients. It adds necessary moisture that helps to loosen the batter. I forgot to do this the first time around and the batter was difficult to mix- it was too stiff! The bundt pan I used is made from glass, which conducts heat faster than dark, non-stick pans. Please adjust your baking time as needed regardless of what’s instructed below. 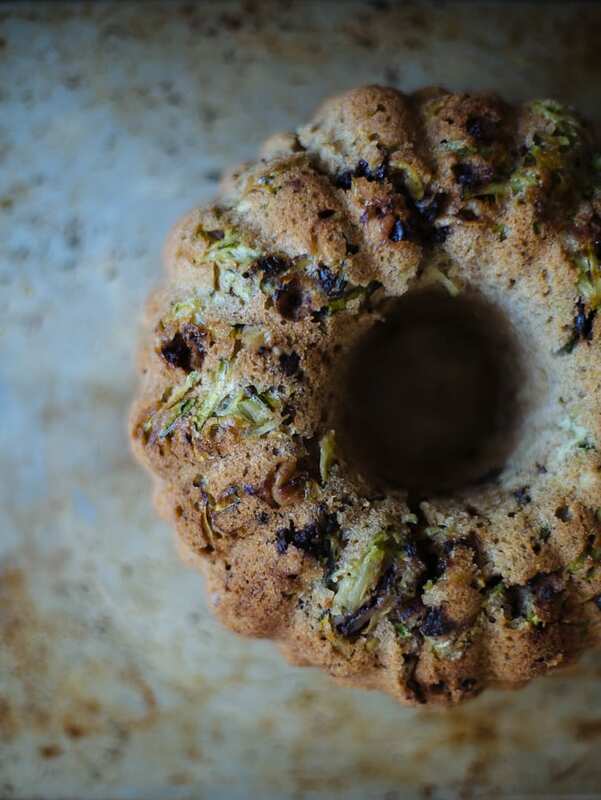 Keep in mind that fresh, in season zucchini is very watery and you don’t want to undercook the cake. The zucchini I used came from my CSA- it was fantastic. Substitutions: dried cranberries, candied ginger or even currants would be nice in this. Also, you’ll notice pumpkin pie spice in the recipe. I chose to add this because it contains a combo of ground ginger, nutmeg and cardamom which adds great flavor. If you don’t have any on hand, it’s not the end of the world. Make-Ahead: this cake can be frozen up to 3 months. Wrap in a double layer of plastic wrap, then foil. To thaw, un wrap and place on a wire rack at room temperature for about 5 hours. *Recipe adapted with changes from Smitten Kitchen. 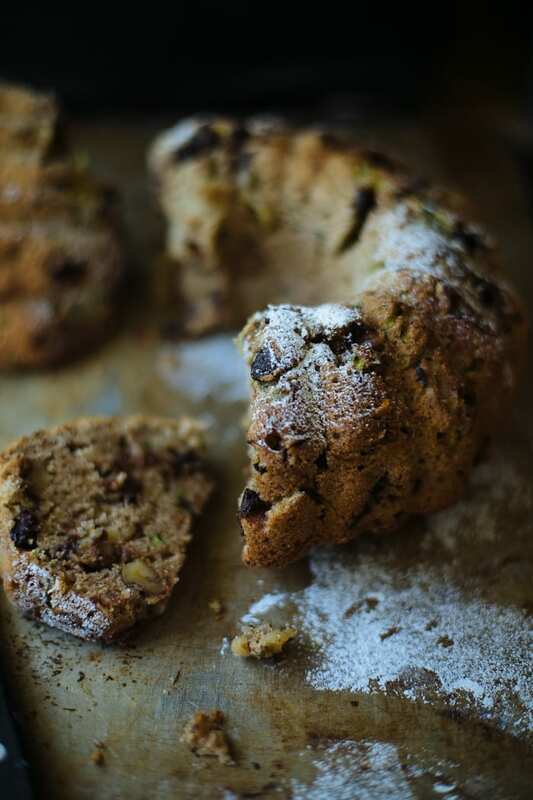 Preheat your oven to 350 F. Lightly coat a bundt pan with butter or oil to prevent sticking. In a large mixing bowl, lightly beat the eggs. Add the oil, sugar, and vanilla and whisk thoroughly to combine. Stir in the zucchini. In another mixing bowl, sift together all of the dry ingredients. Combine the dry and wet ingredients together. 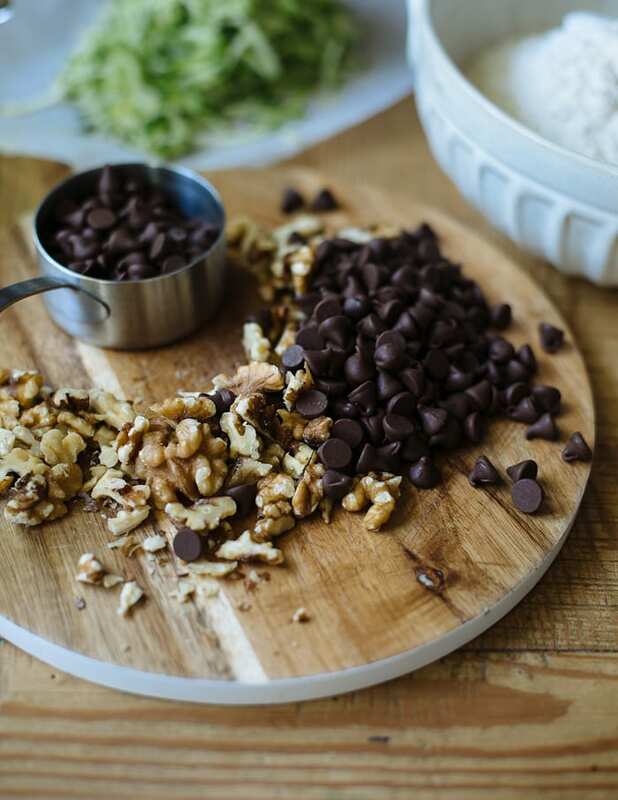 Fold in the walnuts and chocolate chips; do not over mix. Pour the batter into your prepared pan. Tap the pan on the counter once or twice to remove any air bubbles. Bake for about 1 hour and 10 minutes (test at the 1 hour mark). Note: baking times will vary according to the type of pan you are using (my bundt pan is glass and conducts heat faster than dark, non-stick pans). Please adjust your cook time accordingly. Give it a few extra minutes if needed. Cool, in the pan, on a wire wrack for 1 hour. Carefully remove the cake from the pan to finish cooling. Right before serving, dust with powdered sugar. Cut into slices and serve. It’s raining, I’m hungry. I’m making this. It looks fantastic. And by the way, my “supposed to be” bowl of fruit it’s on the counter beside the stove and like yours, it’s always full of everything veggie, but fruit, lol. Fruit tends to fill other bowls but not the one where it should be because there’s no space, lol. Great recipe. will try irt soon. Emilie, your tips are always so pertinent and applicable. I am definitely going to give this recipe a go. I just spied our first three zucchinis out in the garden this evening – little harbingers of zucchini overload to come! ;-) I love the texture here, and I always think that chocolate is the best addition possible. XO! OH! And a sourdough update: I’ve made multiple loaves and am actually babysitting two starters for a friend of mine, who is attending pastry school in France. Mama’s all grown up now! LOL! I love this beautiful bundt cake Emilie! :) Strangely enough, I have never made chocolate and zucchini before! I think this is the year to make it! I would love to make muffins using this recipe! :) So good! The moment I saw your photo, I knew that this was going to be a must make! Zucchini is just starting to show up at the markets, so I know what I’ll be doing with the first haul!! This looks amazing. Of course, chocolate! Oh..my..gosh. I died and went to heaven. If I may…years ago I was inundated with zucchini and made loaves of bread and froze it…I just had a neighbor give me a zucchini from her garden and when I saw this…well thank you! Can’t wait! And glass bundt cake pans? Will be searching the Internet for one. Thank you again…. You had me at chocolate! 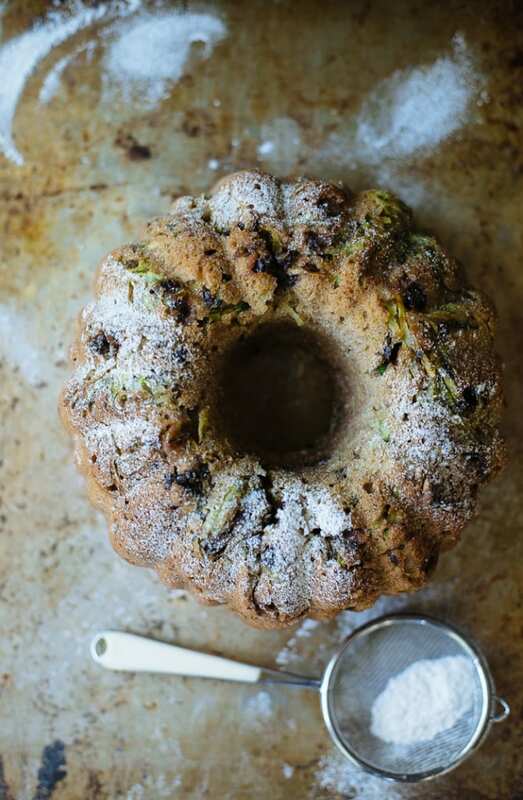 ;) I so need this cake in my life (what better way to eat zucchini!). 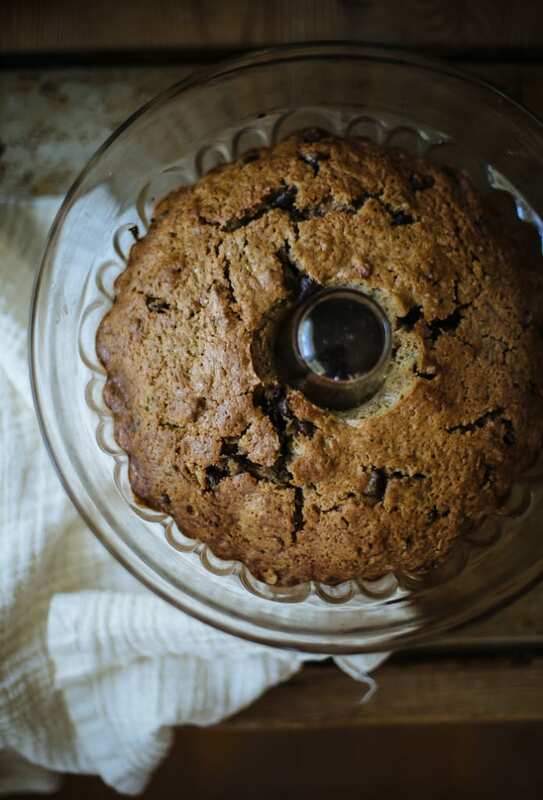 This is a beautiful bundt and the recipe was superb, I am vegan so I just replaced the eggs for an egg substitute and used vegan chocolate chips. I would love to know where you got your glass bundt pan? What a lovely brunch cake! I’ve been experimenting with the powdered sugar pouring down on cake or tarts. I haven’t perfected it yet. It always looks like liquid in my photos. I’m trying to catch the action shot. Your background goes beautifully with the cake. Love the mood! Would you please tell me how much a capful of vanilla is? I’m really looking forward to trying your recipe.